Both sizes shown in Grey. Designed for maximum storage capacity but economical on space. Flush front cupboards. Supplied assembled. Takes Bisley fittings/shelves. With two-point locking mechanism. 5 year guarantee. High 1806mm Cupboard is supplied without shelves. If required it takes fittings/shelves as shown. 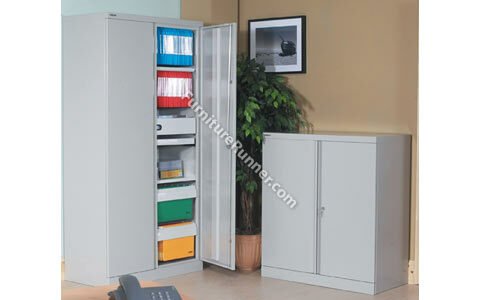 High 1806mm Cupboard with Shelves is supplied complete with three adjustable shelves.